The rear view monitor system assiststhe driver by displaying an image ofthe view behind the vehicle while backingup. The image is displayed in reverseon the screen. This allows theimage to appear in the same manner asthat of the rear view mirror. To display the rear view image on thescreen, place the selector lever in the“R” position when the “IG−ON” mode isenabled. If you move the selector lever out of the“R” position, the screen returns to theprevious screen. Operating another functionof the navigation system will displayanother screen. The rear view monitor system is a supplementdevice intended to assist back up.When backing up, be sure to check behindand all around the vehicle visually. Never depend on the rear viewmonitor system entirely when backingup. Always make sure your intendedpath is clear. Use caution just as you would whenbacking up any vehicle. Never back up while looking only atthe screen. The image on thescreen is different from actual conditions.Depicted distances betweenobjects and flat surfaces will differfrom actual distances. If you backup while looking only at the screen,you may hit a vehicle, a person oran object. When backing up, besure to check behind and all aroundthe vehicle visually and with mirrorsbefore proceeding. Do not use the system when theback door is not completely closed. 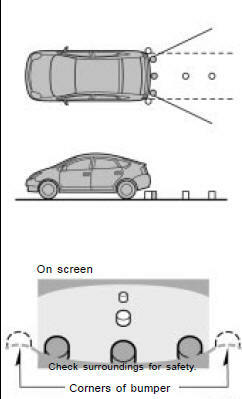 If the back of the vehicle is hit, theposition and mounting angle of thecamera may change. Be sure tohave the camera’s position andmounting angle checked at yourToyota dealer. If the temperature changes rapidly,such as when hot water is pouredon the vehicle in cold weather, thesystem may not operate normally. If the camera lens becomes dirty, itcannot transmit a clear image. Ifwater droplets, snow, or mud adheresto the lens, rinse with waterand wipe with a soft cloth. If thelens is extremely dirty, wash it witha mild cleanser and rinse. Use your own eyes to confirm thevehicle’s surroundings, as the displayedimage may become faint ordark, and moving images will bedistorted, or not entirely visiblewhen the outside temperature islow. When backing up, be sure tocheck behind and all around the vehiclevisually and with mirror beforeproceeding. When replacing the tires, please consultyour Toyota dealer. If you replace thetires, the area displayed on the screenmay change. Image is displayed approximately levelon screen. The area detected by the camera islimited. Objects which are close toeither corner of the bumper or underthe bumper cannot be seen on thescreen. 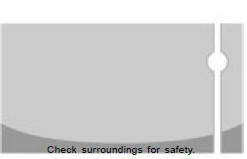 The area displayed on the screenmay vary according to vehicle orientationor road conditions. The rear view monitor system camera islocated on the back door as shown in theillustration. The camera uses a speciallens. The distance of the image that appearson the screen differs from the actualdistance. In the following cases, it may becomedifficult to see the images on the screen,even when the system is functioning. If a bright light (for example, sunlight reflectedoff the vehicle body) is picked upby the camera, the smear effect* peculiarto the camera may occur. *: Smear effect—A phenomenon that occurswhen a bright light (for example, sunlightreflected off the vehicle body) ispicked up by the camera; when transmittedby the camera, the light sourceappears to have a vertical streak aboveand below it.